Solo yachtsman Commander Dilip Donde of the Royal Indian Navy is currently in Port at Lyttelton making preparations for the next leg of the Indian Navy challenge which started this year. Whilst assisting with the preparations, Capt. Peter Rae noticed on his forward bulkhead below that among other plaques one from The Australian Master Mariners. And suggested that it might be appropriate for the New Zealand Company of Master Mariners to present a plaque too. 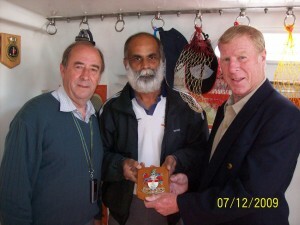 The attached photo was taken at the presentation of the MM plaque to Commander Dilip Donde on board “Mhadei” on Monday morning 7th December 2009. The vessel is the first of it’s kind ever built in India and is an Indian Navy project, with Commander Dilip the first Indian to sail solo around the world. Peter Rea has been acting as agent and general advisor to Dilip during the stay in Lyttelton. The yacht is extremly well constructed and has received much praise from local boatbuilders.